The International Tin Association (ITA) is the main source of global tin industry market information, including scoping of new technology opportunities for tin. 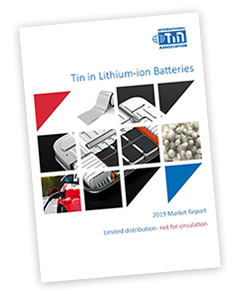 In recent years tracking of tin R&D, patents and markets has highlighted an exciting set of new opportunities in the energy sector, including a significant potential for use in lithium-ion batteries if tin technologies are able to gain market share. On behalf of its tin producer members ITA is pleased to present this report, comprehensively covering the relevant technologies, markets and exploitation pathways for tin. What are lithium-ion battery technologies and how would tin be used? What are the different types of tin product that could be used and how are they made? Why would tin be used and what competitive technologies are there? What are the potential markets and how will they grow in the future? Who are the key players in getting the technologies to market? What are the best estimates that can be made for actual future tin use?